Along with classroom observations, evaluators will use artifacts as evidence to determine formative and summative evaluations of their teachers. After an evaluator approves an educator’s goals, both educators and evaluators may submit artifacts to the online Employee Development and Feedback System throughout the year. The evaluator will use these artifacts to determine professional growth based on both the teacher’s Student Learning/Professional Practice Goals and proficiency in the four Standards in the Effective Teaching Rubric. Artifacts must provide evidence for progress toward goals as well as the four standards. Both these forms of assessment go into a teacher’s evaluation. Artifacts should reflect a scope of evidence that is appropriate for interpretation (ie, one student’s work does not provide enough evidence to reflect the work of an entire class). When submitting artifacts online, teachers and evaluators will provide a rationale for what evidence of professional growth the artifact provides. Well-written rationales that accompany submitted artifacts should clearly indicate goal progress or the proficiency language in the Effective Teaching Rubric. Artifacts can take the form of (but not limited to) student assessment data, student work, lesson plan (with modifications), teacher-made assessments, student surveys, types of parent communication and reports on performance based on conferences and team meetings. Artifacts should be submitted electronically. Hard copies of artifacts documents should be scanned in order to be uploaded into the EDFS. Alternatively, evaluators can enter notes in the EDFS summarizing hard-copy documents, such as certificates. Teachers should submit artifacts throughout the year, rather than all at once. 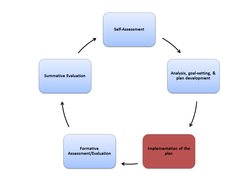 At least three to four artifacts for each standard and goal will be needed to provide an informed evaluation. One artifact may be used for multiple standards and goals. Strong artifacts will also align well to the BPS Priority Areas of MA Curriculum Frameworks Implementation, Data Use and Inquiry, and Differentiated Instruction. Artifact: An original lesson plan that reveals limited student use of higher order thinking skills, accompanied by a modified lesson plan that incorporates stronger use of higher order thinking skills aligned to the MA Curriculum Framework (aligned to proficient language in 1-A-3 on the Effective Teaching Rubric). Evidence this artifact provides: This shows how the educator made adjustments to her original lesson plan to improve student learning outcomes, based on proficiency language on a specific Standard, Element, and Indicator on the Effective Teaching Rubric. The evaluator will likely assess how meaningful the modifications will be in supporting higher order thinking in the classroom. Artifact: Resources from a PD workshop along with a unit plan that incorporates multiple activities and instructional strategies from those resources (aligned to proficient language in IV-B-1 on the Effective Teaching Rubric). Evidence this artifact provides: This shows how the educator took advantage of a Professional Development opportunity that had direct impact on her instruction. Though it’s up to the evaluator to determine whether or not the incorporation of these activities/strategies will be effective, the educator has an opportunity to write a thoughtful rationale to support her artifact. The document below identifies possible sources of evidence for each of the four Standards of Effective Teaching.